• Depending on how big your pie is, you will need 2-3 additional 6oz containers of Driscoll's raspberries. Place crushed Nilla wafers in large mixing bowl. Pour melted butter on top and then use a fork to combine thoroughly. Pour into 9 inch spring form pan. Use hands to flatten and spread over the pan and into the sides, creating a crust. Place in refrigerator to cool for 20 minutes before putting anything inside. In small sauce pan, add 1 cup water, 1 cup raspberries, sugar and lemon juice. Stir and bring to a boil and then reduce heat. Use the back of a wooden spoon to smash raspberries. In small mixing bowl, combine ¼ cup cold water and cornstarch, whisk together. Add cornstarch slurry to saucepan and stir constantly until it thickens (about 1-2 minutes). Place cream cheese in mixing bowl and use a hand-mixer to whip. Place remaining Pie Filling raspberries in a mixing bowl and pour raspberry sauce on top. Gently fold raspberries in one or two times. Take whipped cream cheese and gently spread over bottom of crust. Pour raspberry mixture on top and gently spread evenly. 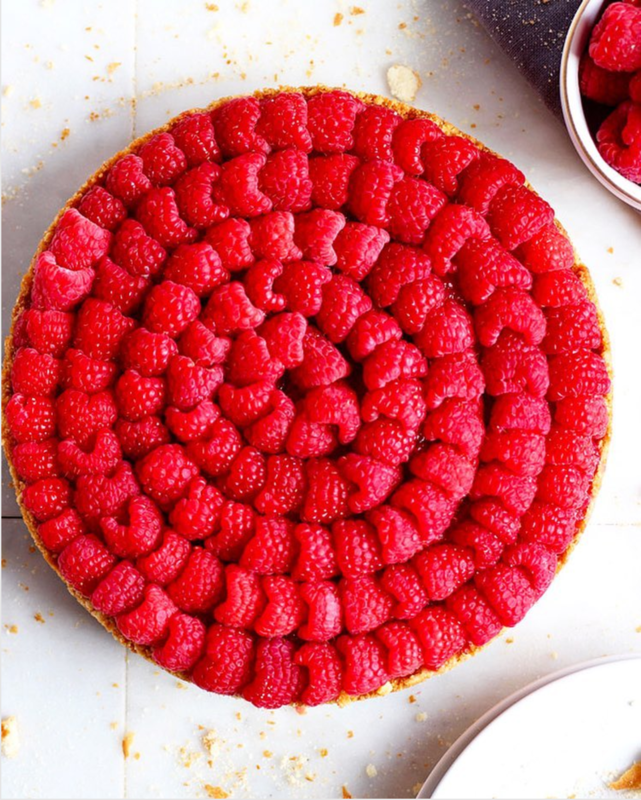 Remove and, if desired, cut your Pie Topping raspberries in half (carefully and with a sharp knife) and place in circles around the pie, overlapping each other as shown in pictures. Cover with foil and place back in refrigerator, preferably overnight, but at least for an additional 2 hours.